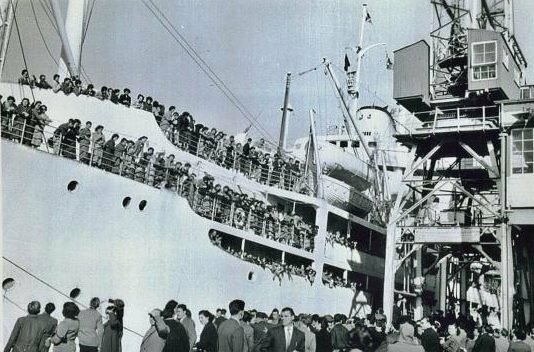 A commemorative event on Sunday is taking place to mark 60 years since a ship with 900 Greek brides arrived at Melbourne’s Port Phillip Bay. The single women left Greece in 1957 to move to Australia and marry — The only thing is that they had never met their future husbands before arriving on the shores of Australia. The year of 1957 was post WWII era and many young Greek women boarded the ship called the “Begoña” and headed off to meet men of whom they had never met before and only had a photograph and name in order to identify their new husbands. With their photographs in hand, they made the long journey to Australia in hopes of a better life. The event taking place is being hosted by Peter Photakis who was on the “Begoña” along with his mother and two brothers and recently told the Greek-Australian newspaper, Neos Kosmos that he remembers thinking that there were a lot of women on the ship which arrived at Port Phillip Bay in Melbourne. “We have scheduled a special event which will take place on Sunday 18 June at the Migration Museum of South Australia, and my aim is to reunite as many brides of 1957 as possible to share their migration stories and shed some more light on a post-World War II era that saw a stream of young women migrating to Australia to start their own families with their future husbands. Husbands whom they had never met before,” says Photakis said. Other people attending the commemorative event are Julian Stefani AM and Steve Georganas MP, both of whom will be guest speakers at the event. Peter Photakis is also expected to tell his own migration story of how he left Rhodes as a boy to come to Australia with his family.